There are three Parish Defibrillators for medical emergencies. Each village has one installed and they are checked and monitored regularly by our Parish Councillors. Lee Moor - on the wall of the Parish Hall. Please note: Claire (dispensing chemist) will be away from 8th - 12 April inclusive. There will be no prescriptions administered during that time, and this could also effect prescriptions for Monday 15th April. Please allow for this if you are receiving regular medication. Order early! So no prescription can be dispensed on either of these dates from Wotter. The next meeting of the Parish Council is Wednesday 3rd April starts at 7.30pm. I, Sophie Hosking, being the Returning Officer at this Election of Parish Councillors report that the latest time for delivery of notices of withdrawal of candidature, namely Wednesday 3 April 2019, having passed, the persons whose names appear below, stood validly nominated and were duly elected without a contest. For List of Parishes and Nomination Information, please click on link below. The Nomination process of Parish Council Elections begins 21st March '19 until 3rd April'19. Have you ever wanted to have a greater say on those local issues within our Parish which have the greatest impact upon local residents? Do you want to play an active role in helping to shape the future of your community for the better? Shaugh Prior Parish Council Elections are due to be held shortly, and applications are sought from those persons wishing to stand as a Parish Councillor. Parish Councils depend on local people taking an interest in the local issues and matters that impact upon their community, whatever their background, and local people standing as Councillors often bring a wealth of knowledge and community understanding into the local council. If you are interested in becoming a Parish Councillor or know someone who may be keen but might just need some encouragement then please get in contact with the Parish Council Clerk by email (scott.smy@sky.com) or telephone number 01752 698305. Parish Council meetings on the first Wednesday of the month at 7.30pm. Venues published on this website under Council business. 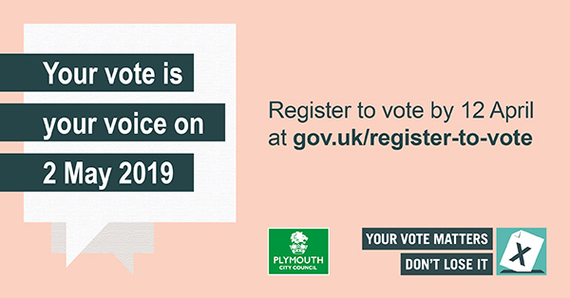 Join us and make a Local Change..
There’s now just one week to go until the voter registration deadline for the local elections. The final deadline is midnight on Friday 12 April. The election on Thursday 2 May will select councillors to represent 19 of the 20 wards in Plymouth. There are no elections in Plympton Chaddlewood this time. Registering can be done online and only takes five minutes. Please find below, the waste and recycling adverts for the Easter, May and Spring Bank Holidays. Please put your bins out accordingly over the holiday period.